Repairs, improvements and maintenance. One call does it all. Guaranteed! Mr. Handyman is your most trusted handyman for all home repairs, improvements and maintenance. Your Mr. Handyman technician is a true professional who arrives on time, in uniform, with a van full of tools. And you can count on him to clean up when the job is done. No job is too small. Whether it's replacing bathroom tiles or repairing a porch railing. 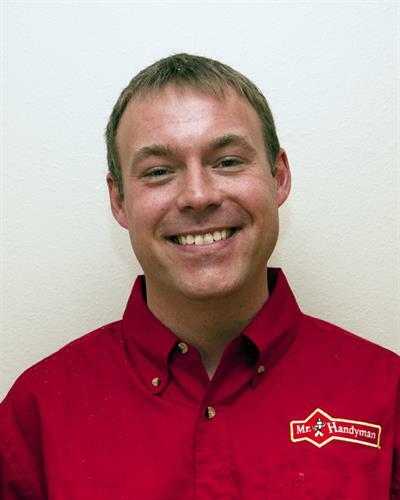 Inside or out, you can count on Mr. Handyman. He has the tools and the experience to do the job right. Our experienced technicians have skills in a variety of trades and can handle most maintenance and repair needs you may have for your home or business. If specialized experience is necessary, we can dispatch a service technician with in depth knowledge in a particular trade to meet your needs. All technicians are our employees; we do not use sub-contractors. We are fully insured and all technicians are bonded and have successfully passed an extensive background check. We look forward to being of service to you, your family and friends in the very near future. The Mr. Handyman slogan is ON TIME. DONE RIGHT. It's more than a slogan. It's our promise!